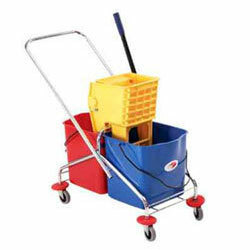 Mop Wringer Trolley offered by us has excellent handle for easy movement. It is widely used in cleaning for carrying boom, mob and other items. We share glorious credentials in the list of top Suppliers of Mop Wringer Trolley from Rudrapur, Uttarakhand. The Mop Wringer Trolley offered by us is known for its superior performance, easy operations and high storage capacity.